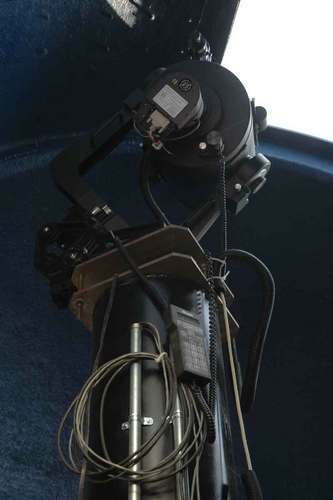 The main instrument is a Meade LX200 12" SCT mounted on a 14 foot tall 12 inch diameter pier embedded 5 feet into the ground and then anchored into the foundation of the observatory itself. (See LX200 Mount) Since we're mostly interested in CCD imaging we also attach an SBIG-ST7 with a cfw8a filter wheel. The filter wheel allows us to do colour imaging. The ST7 is connected to the controlling workstation via a 50 foot parallel cable and we have the choice of either using st7ctl (Linux) or SBIG CCDOps (Windows XP). 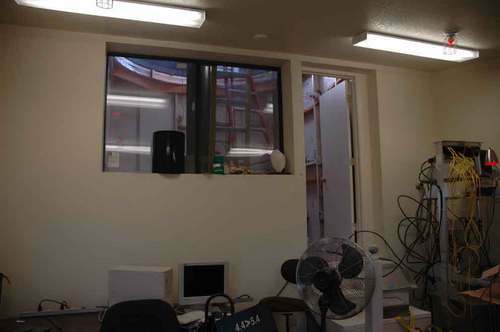 Summary: This equipment is fairly old and someday soon we hope to upgrade our main imaging equipment but there are always other expenses competing with the observatory's needs. The real-time weather data is gathered from temperature probes (outside and inside the dome), wind speed and direction (vaned anemometer), humidity (outside and inside the dome), etc. This data is fed via RS232 into a Fedora Linux system and fed into a MySQL database. The telescope and mount will be sold with the observatory. The telescope is considered "as-is" and no warranties or guarantees are implied.